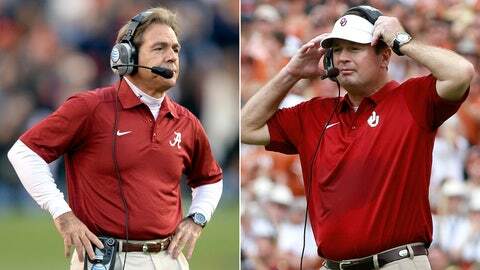 Nick Saban against Bob Stoops would be quite a treat in the Sugar Bowl. This would have been really boring had Ohio State beaten Michigan State in the Big Ten title game, thus commencing the Resume of Auburn vs. the Schedule of Ohio State, Round 937. But, alas, we avoided that ugly quagmire with the Spartans beating the Buckeyes to win the Big Ten crown (watch the highlights here). So where do we stand now in the BCS bowl picture after Championship Saturday? Let’s take a quick look before the official bowl pairings are announced Sunday night. The Seminoles, ranked No. 1 in the country, beat Duke 45-7 to win the ACC championship and finish their season 13-0 (watch the highlights here). They’re locked into the national championship. Auburn, ranked No. 3, beat Missouri to win the SEC title and gets to play FSU in Pasadena with No. 2 Ohio State losing. There’s no other way this could go. Auburn proved its BCS title worth and now bring on FSU, writes Clay Travis. FOX Sports South’s Cory McCartney writes Gus Malzahn is powering Auburn by going against the traditional SEC grain. The Cardinal beat Arizona State in Tempe to win the Pac-12 title and secure a berth to the Rose Bowl. The Spartans, as mentioned above, knocked off Ohio State to win the Big Ten and earn Mark Dantonio’s first trip to the ‘granddaddy of them all’ as Michigan State’s head coach. Arizona State was close to a Rose Bowl berth, and now it has to grasp some difficult perspective, writes Craig Morgan. Stanford’s toughness led it to a Pac-12 title, writes Jack Magruder. Oklahoma State was set to win the Big 12 title and the Fiesta Bowl berth that accompanies the crown if it could beat Oklahoma at home Saturday. It couldn’t, as the Sooners won 33-24. That opened up the door for the winner of Texas-Baylor to claim the conference belt and go to the Fiesta. The Bears took care of that, crushing Texas in frigid Waco 30-10 and securing the program’s first-ever BCS bowl trip. Baylor is likely to play Central Florida in the Fiesta Bowl, as the Knights won the American Athletic Conference title — thus getting a BCS bid — and the Orange and Sugar bowls get to select participants first based on predetermined ordering. FOX Sports Southwest’s David Ubben has some thoughts on Saturday’s Big 12 happenings. With Florida State going to the national title, the Orange has to pick a replacement and an at-large bid. The Orange, based on that aforementioned predetermined ordering, gets the first pick for replacements and could pick Alabama if it chooses and then its at-large team later, which is likely Clemson. But with the Sugar Bowl picking it second, the sense is the Orange will play nice and choose Ohio State as its replacement for FSU — still a great choice, as the only thing that really matters to bowls is if a team has a huge traveling fan base, which OSU does — and leave the Crimson Tide for the Sugar. Well, this has changed. The league champion is now going to the BCS title game, which means the Sugar Bowl has to replace Auburn plus pick an at-large bid. Given the big brand, huge fan base logic bowl executives use for picking teams, it’s likely Alabama goes to the Sugar even though Missouri was the SEC’s runner-up. This would also mean Mizzou gets squeezed out of a BCS bowl entirely, because the SEC would already have two representatives in Auburn and ‘Bama. The Sugar then picks its at-large bid from a pool of Oregon, Oklahoma and Oklahoma State. The best game might be Alabama-Oregon, but the best bet here is the Sooners get the Sugar nod, given their brand appeal and traveling size.